Kurdish activists in London have begun a four-day hunger strike on the northern terrace of Trafalgar Square, in parallel with similar actions which have taken place within Turkey and across Europe. A hunger strike started by the Kurdish politicians imprisoned in Turkey has now turned into an indefinite hunger strike, which has involved over 8000 people, as a result of the complete disregard of the protest by the Turkish government. The first strikes began on 12 January 2012 to coincide with the 13th anniversary of Abdullah Ocalan’s handing over to Turkey as a result of an ‘international conspiracy’. Over the last three years, elected MP’s mayors and local councillors, journalists, students, human rights activists, and academics – have been sent to prison in what Prime Minister Erdogan’s government refers to as ‘counter-terrorism operations’. The PKK is listed as a terrorist organisation internationally by NATO. The PKK leader, however, claimed in an interview that the only reason they have been put on the ‘terrorist organisation’ list is due to political pressure from Turkey, who he accuses of falsifying accounts and unfairly demonising the organisation. One protestors said: “As a group of Turks who are fighting for democracy and freedom, we declare that we are starting a hunger strike. Calling for an end to the political and military genocide and demanding Freedom for Abullah Ocalan and status for Kurdistan. “Kurdish political activists are on hunger strike from this morning [Tuesday] until Saturday. They claim that the international public have been oblivious to the so-called ‘KCK (Koma Civakên Kurdistan) operations’ carried out in Turkey by Prime Minister Erdogan and his Justice and Development Party for the past two years. Under the appearance of ‘fighting terrorism’ the Erdogan government has allegedly been using the judiciary, the police, and the media to penalise all civic activism in support of rights demanded by Kurdish citizens in Turkey. Arrests have been made over speeches, newspaper articles and poetic expression that support Kurdish rights in Turkey. Amnesty International has recently expressed its concern over the vague and broad anti-terror laws in Turkey. “Under existing legislation prisoners’ rights are violated, that punishments are arbitrarily applied and that appeal against the imposition of punishments is not effective. Turkey has defined terrorism not by actions and tactics but by political aims, which has led to thousands of individuals being prosecuted for membership of a terrorist organisation or for denigrating ‘Turkishness’. 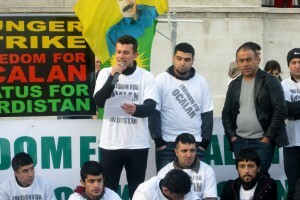 The protestors handed out leaflets of their several demands while wearing t-shirts with the slogans “Freedom for Ocalan” and “Status for Kurdistan”. The 20 strikers are also demanding freedom for Abdullah Ocalan, the founder of the Kurdistan Workers’ Party (PKK), who is currently jailed on the prison island of Imrali in almost complete isolation and without access to lawyers since July 2011. The prisoner has been kept in isolation for more than several months without any visitors, letters or phone calls. This is apparently the longest period of total isolation during the 13 years that Imrali Island has served as a ‘maximum security prison’. 36 members of Abdullah Ocalan’s defence team were also arrested and imprisoned in December 2011. Negotiations had started in 2006 between the Kurdish people’s leader Mr. Abdullah Ocalan and the Turkish state, but talks were ceased in July 2011 by the AKP government which ended with no positive steps taken. The Kurds have long complained that the Turkish government was trying to destroy their identity and that they suffer from economic disadvantage and human rights violations. They refer to this in their list of demands calling it the ‘Kurdish question’. The issue of threat to Ocalan’s health and safety must be placed immediately on the agenda of the Council of Europe and its agencies in order to alleviate our existing fears. The intensified isolation of Ocalan, which has not only massively unsettled the Kurdish people, but could also be the cause of war with heavy casualties, must be lifted immediately. There must be the possibility again of consultations between Ocalan and his lawyers. International institutions, above all the Council of Europe, must take the initiative to ensure the release of Ocalan and to resolve the Kurdish question. The Council of Europe must recommence the ‘monitoring’ process due to the oppressive and violent politics of the Turkish state towards the Kurds. If Turkey continues on their current path, their membership must be suspended. The EU and the European states should end their support for Turkey’s violent politics of denial, and use their influence to promote a fair and peaceful resolution to the Kurdish question. The first step towards this is to take the Kurdish freedom movement off the terror list, on which it was initially unfairly placed. In order for the Kurdish question to be steered through democratic and political channels, Abdullah Ocalan’s conditions must be immediately improved, so that he can be politically active. For this, international organisations and institutions must take the initiative. Finally, we ask the international democratic public and its organisations to actively support, and declare their solidarity with, the fight of the Kurdish people for democracy, freedom and peace. Currently doing my masters at Bournemouth University 'Media School' in International Journalism. Lived in Bristol for three years doing my BA in Drama and Creative Writing at The University of the West of England (UWE). I was a Stage Manager and director for six months for the play 4:48 by Sarah Kane. Before this, I lived in Ramsgate, Kent where I practised my photography skills and writing by the sea. I would like to travel somewhere longer than an hours flight and immerse myself in a different culture.